Rowman & Littlefield International, London and New York, 2016. In this short book, Alejandra Mancilla sets out to remedy a problem within moral cosmopolitan literature that addresses global poverty. According to Mancilla, moral cosmopolitanism has failed to address the question of what the chronically deprived may do to meet their basic needs of subsistence. Mancilla’s solution is to revive the right of necessity: the right for a person to take or use that which they require for self-preservation within the boundaries set by the basic rights and the significant moral interests of others. As well as remedying some of moral cosmopolitanism’s blind spots, Mancilla claims that the recognition of this right would have substantial normative and practical implications. For example, when the need is legitimate, acts of ‘pickpocketing, pilfering, squatting, and occupying unused land’ would be reinterpreted as instances of exercising the right of necessity (112). The right could also form the basis of collective movements led by the poor to act to secure their needs. Finally, Mancilla argues that recognition of the right would place a duty on everyone to reinvent the global economic order so as to eliminate systematic deprivation. The book is divided into two parts. The first examines the emergence of the right of necessity in the work of medieval Christian canonists and theologians followed by the application of the right of necessity within the secularised work of Hugo Grotius. Mancilla then compares this with Samuel von Pufendorf’s account of the right of necessity, arguing in favour of Pufendorf’s account over Grotius’s. Her argument is that because Grotius omits arguments that Pufendorf supplies, Grotius’s version of the right allows for an interpretation where the owner of a resource the needy person requires may prevent or compete with the needy person for that resource. Mancilla’s argument seems uncharitable to Grotius. This is because Grotius attaches a condition to the right of necessity that it is not to be exercised against those who are equal or needier. Because of this condition, for Mancilla’s argument to make sense, we would have to interpret Grotius as saying that it is impermissible for a needy person to compete with another person who is equally needy, but permissible for the owner of the resource to interfere with the needy person. Yet nothing in Grotius’s argument implies this. It instead makes more sense to interpret Grotius as simply saying that since one ought not to cause excessive harm to another, both the equally or less needy person, and the owner of the resource, ought not to prevent the needy person from accessing the resource in question. In the second part of the book, Mancilla gives her own account of the right and its implications and responds to objections. The remainder of the review focuses on the second half, because it appears that the second half of the book can be read and appreciated without reference to the first. Further, it is in this section where Mancilla’s own substantive contribution to contemporary problems lies. Mancilla’s own account of the right of necessity is built on the foundation of six assumptions. Her normative assumptions include; ‘moral cosmopolitanism, the existence of a human right to subsistence, the acceptance of the institution of property as a salutary social arrangement, and the belief that any reasonable system of property must have the satisfaction of everyone’s basic needs built into it as an internal limitation’ (15). She works from the empirical assumptions that most people participate in an interdependent and interconnected global economic order comprised of states and the widespread institutionalisation of property, and that the conditions exist for everyone’s basic right to subsistence to be fulfilled. Here, two points should be noted. First, Mancilla understands the concept of property in a general way, and not specifically as private property (15). Second, for readers who may not be aware, her moral cosmopolitanism comprises three central claims typical of the cosmopolitan tradition: that ‘individual human beings are the ultimate unit of moral concern’, that this concern applies to all in equal measure, and that ‘this status is to be acknowledged by everyone else’ (1). She summarises this as the belief that there is a ‘global moral society of which all human beings are part, and in which we all bear certain duties to, and hold certain rights against, each other’ (15). 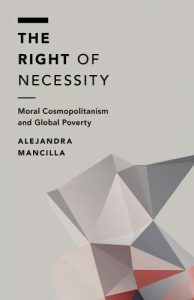 Mancilla argues that the right of necessity is justified based on each individual’s right to basic subsistence, and so the right of necessity is to be understood as a ‘concrete expression’ of that right (65). The right of necessity’s role is to stipulate what is permissible to do by and for those whose subsistence needs are not met. Practically, Mancilla argues that people’s right to subsistence ought to be included in any system of property rights because a property system that requires people to accept an arrangement undermining their basic rights would be irrational. Thus, when the property system results in chronic deprivation and so fails to meet people’s right to subsistence, the needy (or others on their behalf) may exercise the right of necessity as a counterpart to their right to basic subsistence and take the property of others to meet their needs. What then is meant by the object of the right, an individual’s basic subsistence needs? Mancilla defines the object of the right as the material that minimally secures ‘physical and physiological well-being’, i.e. that which is needed for self-preservation (66). She adds that the things needed for self-preservation should be understood to include that which indirectly serves to obtain it. This could include money, shelter, a plot of land and possibly things like mobile phones which might be necessary to bring oneself out of chronic deprivation. This means that the kinds of things that should be understood as legitimate resources for the person to take should relate to the kind of need they have. Developing on this point, Mancilla adds three limitations to the right’s exercise: that the need in question is basic; that the right is not used to undermine equally important moral interests of others or the exerciser of the right themselves, and that the right is to be exercised as a last resort. Further, Mancilla argues the right of necessity contains within in it a duty of non-interference and a final duty related to changing the overall system which leads to chronic deprivation. Each of these categories has nested within them two more specific duties: an immediate and a mediate duty. The immediate duty is to refrain from preventing a needy person or someone on their behalf from legitimately acquiring a needed resource, while the mediate duty is to make available the resources a needy person might need. In other words, the mediate duty is to not block off access to superfluous resources by building things like fences, walls, and security systems to prevent or stifle access to the resource. These duties are included to prevent the right from being ‘toothless’. The final duty entails a further negative and positive sub-duty. The negative duty is to not uphold or create conditions where people need to chronically claim the right of necessity. The positive duty is ‘to create conditions where the exercise of the right of necessity by the chronically deprived ceases to exist’ (86). These negative duties are grounded in both Mancilla’s six assumptions and a kind of contractarian claim that because of these we have a duty (that can be fulfilled) to create and uphold an arrangement where nobody’s right to subsistence is chronically unmet. One of the central assumptions behind Mancilla’s argument is that most people live in a globally interconnected and interdependent economic order (a system). However, Mancilla provides little indication of the nature of this order outside of the usual references to poverty and inequality figures. Yet we should remember that the nature of this order matters; one might point out the temporal nature of the system and that over time a system might progress or regress. For example, one might argue that this globally interconnected order has overall improved and is improving the lot of those worst off. One might even agree that inequality is increasing, but still argue that the baseline level of the worst off is generally improving (as the World Bank suggests). One might, then, agree with Mancilla that something like the right of necessity might be needed in a time of transition but deny that the final duties are necessary or particularly radical. This offers an example of the kind of argument that Mancilla might have addressed in order to make the book’s argument more compelling and clear. The lack of engagement with thinkers outside of the moral cosmopolitan tradition is frustrating. For example, there are no references to Marx or Marxists. Mancilla’s only engagement with a non-cosmopolitan thinker is through a mistaken dismissal of one of Alasdair MacIntyre’s arguments in Whose Justice? Which Rationality? Briefly, Mancilla interprets MacIntyre as ruling out the possibility of the translatability or commensurability of concepts from different historical traditions (26). However, nowhere does MacIntyre rule out the possibility tout court. Rather, his argument is that there are traditions of thought with different understandings of the requirements of truth, rationality, justice, etc. These different understandings may make translatability and commensurability quite difficult and sometimes impossible. MacIntyre’s argument means that one tradition’s attempt to appropriate or criticise another tradition’s concepts may fail to comprehend them and therefore fail to do justice to that tradition. However, MacIntyre’s argument does not mean that a contemporary secular cosmopolitan (e.g. Mancilla) cannot make use of the ideas of past secular cosmopolitans (e.g. Grotius and Pufendorf). Due to the lack of engagement with other approaches and traditions, the approach and central question of the book—on ‘what the needy may be morally permitted to do’ (3)— seems open to question. Mancilla frames her argument as a response to everyday scenarios where the needy could be legally punished for taking what they need, therefore the right of necessity suggests that they may morally break the law. But it’s hard to imagine an opponent reasonably making the case that someone who is below the subsistence line ought morally, ethically, or practically to starve because the law says so. Even if someone did make the case, they are unlikely to share Mancilla’s cosmopolitan assumptions and so are unlikely to be convinced otherwise. Rather, it seems clear that the needy may morally do what they need to do to bring themselves out of that scenario, outside of the fairly obvious points that they may not take too much, murder, excessively harm others, etc. In light of this, it seems natural to ask, why generally do we need a moral solution to what seems to be a political problem, namely, global poverty? Lastly, an important feature of Mancilla’s argument is that it leads to a claim that the global economic system needs to be changed. Significantly, one does not need to be a cosmopolitan thinker in order to make this claim. However, it is one thing to say that we should act to change the world, but the important question is, as always, what is to be done and how. Charity? Redistribution? Intervention? Recognition and enforcement of the right of necessity in international law? This is where the crux of the debate lies both in scholarly and public discussion. My sense is that while few people believe that all is right with the world, the problem is that much fewer agree on how exactly to right it.